Lurline's Place: A Little Ray of Sunshine! A Little Ray of Sunshine! On 26 January 1967 a Little Ray of Sunshine came into my life - we called her Angela Yvette! 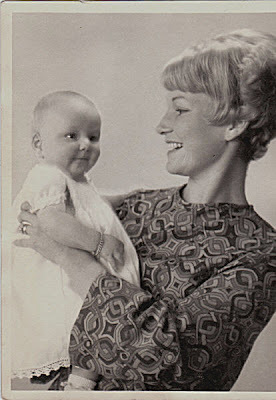 Here she is taken with her Mum and published in the Mount Isa newspaper, July 1967! I think she looked just gorgeous in brother Aaron's christening dress - smocked, embroidered and crocheted by me ! My home made top made by me, too - I was saying to the girls last night how trendy I thought it would be even today - they rolled around the floor laughing - not nice! Up top - the unfinished birthday quilt - I just couldn't make the deadline - tried hard! Hopefully will get a lot more snipping done tonight while watching the tennis! Above an Award from Julie at Bush Baby Jag - how lovely, thanks Julie! I am to pass this award on to 5 lovely people - mmm, will have to have a think - I don't usually single people out, but have stumbled across a few fab blogs lately! This is one - from Joe of mangiere - a fabulous chef and son of Julia. Do pop across and pay Joe a visit - you won't be sorry - look at this wonderful dish of wild mushrooms above - and a cookbook in the making. A recent restrateur, Joe has moved on to a new life and just returned to Blogland - welcome, Joe! I thought this could be a fairly boring Post to start, so I added a pic of my Flowering Almond quilt! 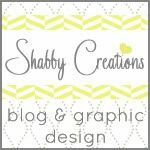 I posted about this way back last March when I first started blogging, so many of you may not have seen it. My own design and a reproduction of an 1840? quilt now hanging in the University of Michigan Museum. All hand appliqued and hand quilted - it was a real pleasure to stitch and still brings me great joy! Off to prepare to watch the wonderful Jelena Docic tonight - all the very best of good luck! I loved this post. Angela Yvette is precious in her brother's Christening gown and your "mod" top is quite smashing! 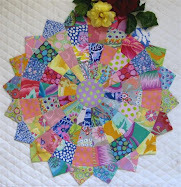 So glad you posted again about the Flowering Almond quilt - that is truly amazing. Hope you have a great day. Exquisite work on your Flowering Almond, Lurline. That is amazing! Forget about their laughter, they obviously don't watch the fashion trends. 60s Retro is very very IN! Wow Lurline, your Flowering Almond Quilt is stunning, it must have taken you ages to make!! Gorgeous piccy of you and your daughter too .... just lovely :o). one yummy mummy,that quilt would have to be my all time favorite. Yes I too am watching the Tennis,hope she can make it. You looked as gorgeous as Angela in the photo. Oh the flowering almond quilt is just stunning. Shame Jelena didn't win tonight but didn't she do well? Happy birthday Angela. Enjoy you new quilt. And yes, yummy mummy. You have age a bit. Off to bed. I too have been watching the tennis. The men on now but cant keep my eyes open any more. Good night. Lurline-I love the top you are wearing and I would definitely wear it today. What a nice picture of you and your sweet one. I like the quilt above that pic too. The mushrooms look yummy. I will check out Joe's blog. 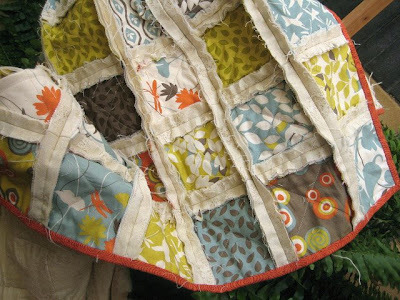 Your reproduction quilt is stunning. 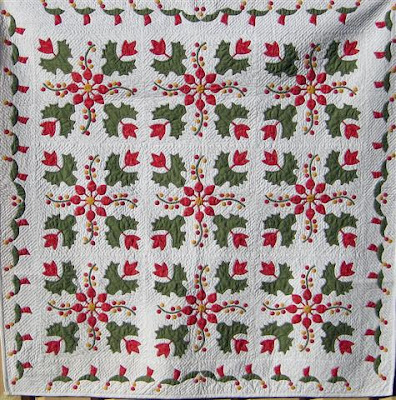 I love these applique quilts and the time it takes to do all the handwork and hand quilting, wow, what a treasure for you and your family. Have a great day! Wow flowering almond is absolutely stunning. What's old is new again...do you still have your top? My daughter so wishes I'd saved my bell bottoms, etc...from the 70s. I do have my puka shells. The quilt is just magnificent and I love the pix of you and Angela, it is so sweet! My son was also born on the 26th of January, just a few years later. :D I always love coming to visit your blog, there is always something wonderful and inspiring to look at. Have a wonderful day! I just love that picture of you and Angela. What a keepsake!! And I agree your girls are just plain rude to laugh at your trendiness. I think you would just blend right in today. Happy Birthday to you sweetie! You really were looking trendy, nice picture of both of you. The quilt is absolutely stunning, you should be proud. That picture is just soo cute! What a darling moment. A love award... never seen that one before! How long will your beautiful Flowering Almond be hanging at the museum, or is it a permanent fixture there? You look stunning here, hey, retro is in again. Don't tell Ed, but I can see a bit of him in Angela here! I love that quilt, what a lot of work, and you did a beautiful job of it.. Your Flowering Almond quilt is stunning. I love the colors. You are very talented. You haven't changed a bit, priceless photo..shaggy looking quilt, but your other quilt Lurline, goodness that is stunning. A Good Read and More Happy Houses! Wow - Finished and She Loves It! Getting Ready for Australia Day! Thursday, 15 January 2009 - Ben's Birthday! Hexagon Medallion and Perth's Wheel! My Dilly-Bag and Mosaic Hexagon Quiltalong! A Pretty Quilt for a Beautiful Girl! Angels, Dollies, Rattles and Dilly-Bags! New Year's Resolutions ... 2009!! !